LANSING — As state lawmakers weighed millions of dollars in new incentives for businesses bringing large development projects, some of those pushing hardest for the incentives opened their checkbooks to make political contributions. According to a review of campaign finance disclosures, donors connected to the main groups lobbying for the tax incentive bills gave more to lawmakers’ political action committees (PACs) over the first four months of 2017 than they had over the same period in previous years. Quicken Loans, a mortgage lender pursuing a project in Detroit, has championed bills to allow developers to capture a portion of tax revenue tied to projects deemed “transformational.” Donors who listed Quicken Loans as their employer gave more to lawmakers’ leadership PACs over the first 110 days of 2017 than they had in entire years previously. The Business Leaders for Michigan has led the charge for another package of bills that would allow businesses creating a large number of new jobs to capture a portion of new income tax revenue. 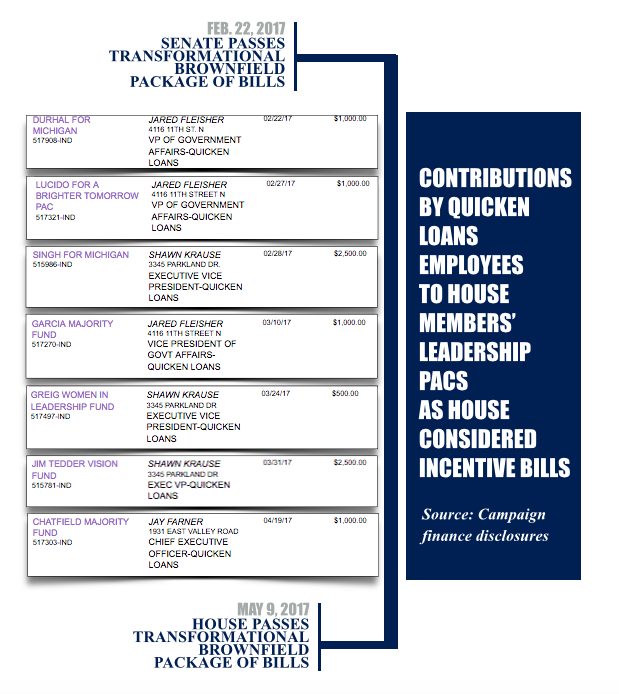 The Business Leaders PAC handed out its two largest individual contributions to specific lawmakers on record in February 2017: $50,000 to a PAC connected to House Speaker Tom Leonard, a Republican from DeWitt; and $50,000 to a PAC connected to Senate Majority Leader Arlan Meekhof, a Republican from West Olive. “There was no magic to the timing, and it’s not about one specific policy goal,” said Kelly Chesney, spokesperson for the Business Leaders for Michigan. As in past years, the organization is working on a variety of major policy changes. Quicken Loans declined to comment on this story. There are lobbyists and lawmakers in Lansing, however, who believe money has played a role in advancing the tax incentive bills. And they note that the bills appear to go directly against the past public positions of some lawmakers who voted in support of them. Rep. Steven Johnson, a Republican from Wayland, opposed the bills backed by Quicken Loans on the House floor earlier this month. In an interview with the Michigan Public Radio Network, he said Dan Gilbert, chairman and founder of Quicken Loans, and his company stand to make millions through the new incentives. Johnson said the coalition backing the package of bills known as the “transformational brownfield bills” — some have called the bills the “Gilbert bills” — had lobbyists that were in Lansing every day. The lobbyists were talking to lawmakers “constantly,” Johnson said. During an April 2017 House committee meeting, Jared Fleisher, a lobbyist for Quicken Loans, noted that he had had “many discussions” with one lawmaker who was in opposition to the bills. The office of that lawmaker, Rep. Martin Howrylak, a Republican from Troy, said last week that Fleisher and Howrylak had actually had four meetings. A similar package passed the Senate in November 2016 before stalling in the House in the last month of the 2015-2016 session. Gilbert himself came to Lansing to testify in favor of the bills during a House committee hearing in December 2016. Gilbert told the committee that to break even or to have a small return on difficult yet transformational projects in Detroit, there would need to be some type of partnership with the state because of the cost of the potential developments. “We’re still short unless we have some kind of partnership that’s not a partnership of no return, but a partnership that returns an immense amount of value to the state of Michigan,” Gilbert said. According to MiThrive, the coalition backing the bills, the legislation would pave the way for a $2.5 billion project in Detroit by Gilbert’s umbrella company, Rock Ventures. Rock Ventures and Quicken Loans spent more on lobbying in 2016 than they reported spending any previous year over the last decade. Their total spending in 2016, $144,077, nearly tripled their total spending in 2015, $49,061. 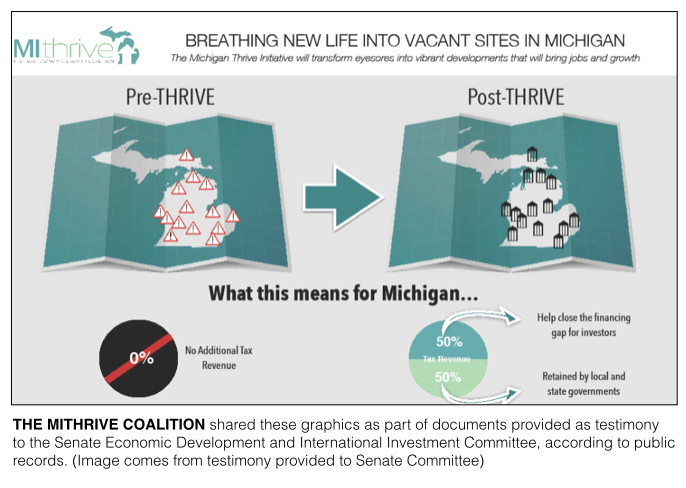 After the brownfield bills stalled in 2016, supporters reworked them and re-introduced them in 2017 with a broader coalition of supporters who argued the bills would spur projects in locations across Michigan. The new bills, Senate Bill 111-Senate Bill 115, passed the Senate on Feb. 22 before returning to the House. Between Feb. 22 and April 20, the end of the most recent campaign finance reporting period, employees of Quicken Loans made $9,500 in contributions to House members’ leadership PACs. Most of the contributions came from Fleisher, who lawmakers have identified as the main lobbyist working on the bills for Quicken Loans, and Shawn Krause, who “leads the company’s government advocacy program in Washington, D.C.,” according to her online biography. Many of the contributions from Quicken Loans employees this year went to key lawmakers who could hold sway over what happens in the chamber. The PAC connected to House Minority Leader Sam Singh, the top Democrat in the House, received $2,500 from Krause, according to campaign finance records. The PAC connected to Rep. Jim Tedder, the Republican who chairs the committee where the bills were sent after they passed the Senate, received $2,500 from Krause as well. The PAC of House Speaker Pro Tem Lee Chatfield, one of the top Republicans in the House, received $1,000 from Jay Farner, chief executive officer for Quicken Loans. The PAC of House Minority Floor Leader Chris Greig, a top Democrat, received $500 from Krause. For the entirety of the first reporting quarter of 2017, Jan. 1 to April 20, leadership PACs connected to lawmakers reported receiving $12,250 from Quicken Loans employees. In the last decade, lawmakers’ leadership PACs had never reported receiving so much from Quicken Loans employees or the Quicken Loans PAC over an entire year, according to campaign finance records. Disclosures on how much individual candidates’ campaigns received from donors won’t be available until July. Gilbert himself is a large campaign giver on the federal level — he made $1.6 million in contributions to federal committees last cycle, according to one count — but because of his financial interest in the Greektown Casino, state law prevents him from making contributions directly at the state level in Michigan. Tedder is one of the lawmakers who had voiced concerns publicly about backing the incentive bills for businesses while the Legislature stalled on income tax relief for individuals. But Tedder’s committee, the House Tax Policy Committee, voted to advance the brownfield bills to the full House on April 26. Tedder said his support for the package was not connected to the contribution to his leadership PAC that came on March 31. It was the only contribution the Jim Tedder Vision Fund reported receiving during the fundraising quarter. Tedder voted for the bills on the House floor on May 4 along with a majority of his colleagues, including Chatfield, who chaired the committee where similar bills stalled in 2016. In a Dec. 9, 2016, radio interview with journalist M.L. Elrick, Chatfield said it was unfair to provide incentives for some developers that weren’t available to all developers. In May, Chatfield, now a member of House GOP leadership, voted in favor of a revised version of the bills Quicken Loans supported. "Unlike the previous proposal, the legislation that passed this year was heavily amended to take liability off taxpayers and put the risk for potential losses on the developers,” Chatfield said in a statement. Chatfield told the Michigan Public Radio Network last week the 2016 bills emerged late in the session and there wasn’t enough to time to fully examine them. “I’m not comfortable voting on bills unless they’re properly vetted,” Chatfield said. The contribution to his leadership PAC didn’t impact his decision, he added. The future of the “transformational brownfield” bills will be up to Gov. Rick Snyder. Like Chatfield, Snyder previously spoke out against tax incentives and credits that favor certain businesses over others. His budget presentation in 2011 said of Snyder, ‘He proposes a simple, fair and efficient Corporate Income Tax that will even the playing field and enable all businesses and industries, large and small, to grow and create jobs. This session alone, the bills backed by Quicken Loans made it to Snyder, and the other package, the so-called “Good Jobs for Michigan” package, backed by the Business Leaders for Michigan, is also progressing through the Legislature. The “Good Jobs” bills, which would allow for businesses adding large numbers of new jobs at certain pay rates to capture a portion of income tax revenue, passed the Senate on March 29 and are now before the House Tax Policy Committee. They are Senate Bill 242 through Senate Bill 244. 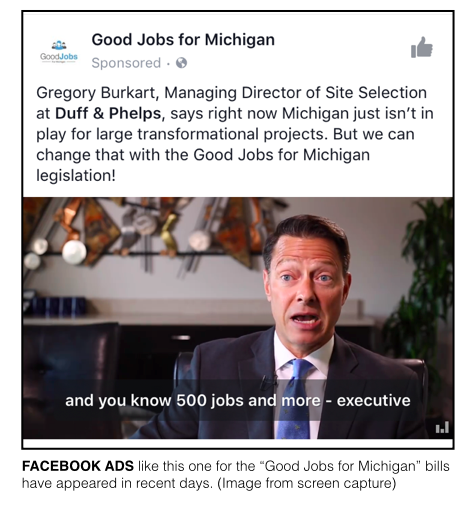 The Business Leaders for Michigan, which supported the “transformational” package, is more heavily backing the “Good Jobs for Michigan” bills (there are even sponsored Facebook advertisements about the bills), according to lawmakers. 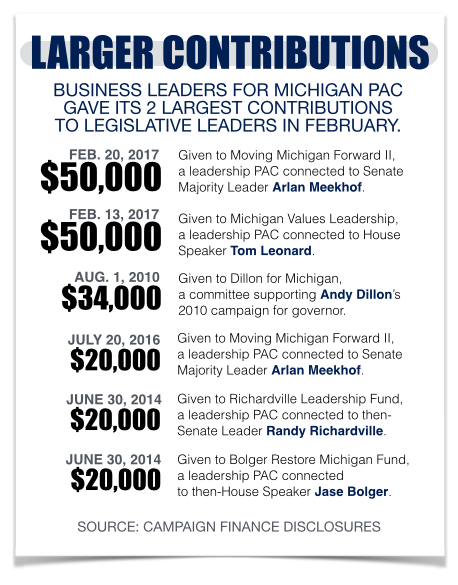 The Businesses Leaders for Michigan PAC has been a large campaign donor over the years, including $50,000 to PACs connected to Meekhof and Leonard in February 2017. Similar bills to the new “Good Jobs” bills stalled in 2016. Spokespersons for Meekhof or Leonard declined to comment on this story.